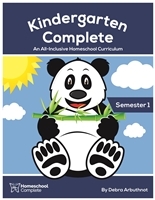 Kindergarten Complete will help you start your homeschool journey with confidence. The curriculum includes the daily lesson plans, organization and planning suggestions, and teaching procedures all in the convenience of a sturdy three-ring binder. The lesson plans are written with step-by-step instructions so there is no guesswork or lengthy planning sessions for the parent. This integrated, unit-study curriculum makes teaching more effective, and increases the child’s comprehension and retention of the skills. The deluxe bundle includes Teacher's Manuals and Student workbook pages for both semesters, plus ten sets of flashcards, a bingo game, two memory games, clock with dry erase marker, plastic links, dice, magnifying bug viewer, three charts, a 12-month calendar, and a one-year spiral-bound planner. The full year bundle includes Teacher's Manuals and Student workbook pages for both semesters, plus seven sets of flashcards, a bingo game, memory game, clock with dry erase marker, plastic links, dice, three charts, and a 12-month calendar. The semester one bundle includes the Teacher's Manual and Student workbook pages, plus five sets of flashcards, a bingo game, a memory game, plastic links, dice, two charts, a 12-month calendar, and a one-year spiral-bound planner. The semester two bundle includes the Teacher's Manual and Student workbook pages, plus five sets of flashcards, a memory game, a write-on clock with dry erase marker, plastic links, dice, magnifying bug viewer, two charts, and a 12-month calendar. Spend time with your child-not planning! The teacher's manual includes the detailed lesson plans for all subject areas and the required student workbook pages. Bound in a sturdy three-ring binder so the pages are easily removable for daily use. Functions also as a portfolio of your child’s work. The weekly, thematic units cover all academic areas with fun and meaningful lessons. The additional student workbook is designed for each additional child using the Kindergarten Complete curriculum. The teacher's manual includes the detailed lesson plans for all subject areas and the required student workbook pages.